Due to the rise in popularity of the sport, swimming events were held in the inaugural modern Summer Games in Athens in 1896. They were very different from the events held today, though. They were held in the open Mediterranean sea in the Bay of Zea, which was unusually icy cold for the time of year. 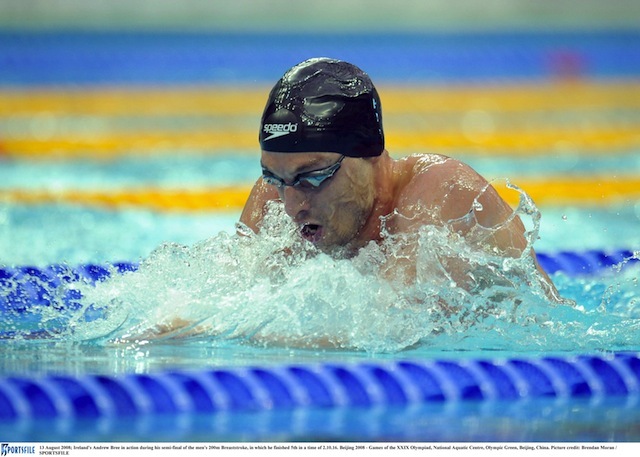 Events were held for men only, and included the 100m, 400m and 1500m freestyle and breaststroke, with the 100m and 1500m being won by Hungarian Alfred Hajos, who had been inspired to take up swimming following the death of his father in a drowning accident. 40,000 people turned up to watch, though, confirming the popularity of the sport. In the 1900 Summer Games in Paris, France, events took place in the River Seine, with a 200m backstroke competition added to the swimming schedule, as well as one-off contests for underwater swimming and an obstacle race. The 50m freestyle and 100m backstroke were added to the programme in the 1904 Summer Games in St Louis, USA, while women were allowed to compete in their own swimming events in the 1912 Summer Games in Stockholm, Sweden. Events moved from natural open water to a more manageable 100m-long pool for the 1908 Summer Games in London, England, with the adoption of the now-standard 50m pool coming in the 1924 Summer Games in Paris, France. The butterfly stroke was created in 1940, when breaststroke swimmers they could go even faster if they moved their arms over their head, and butterfly events joined the Olympic swimming programme for the Summer Games in Melbourne, Australia, in 1956. Today, men and women compete in virtually the same list of wide-ranging disciplines in a 50m controlled, heated pool – the only difference being that the long-distance race for men covers 1500m, while for women it covers 800m. For all swimming events, competitors take part in heats, with the fastest eight going through to the final. The fastest four swimmers in the final are placed in the middle four lanes, which have the slight advantage of less water turbulence. Electronic touch pads are used at each end of the pool to time the competitors, and competitors must touch the wall at each end of the pool whilst they’re doing underwater turns at the end of each lap. In all swimming events, the individual or team with the fastest time wins. Events: 50m, 100m, 200m, 400m, 800m, 1,500m. The 800m event is only for women, while the 1,500m is only for men. Freestyle is the quickest and most popular swimming style. Technically, freestyle competitors may use whatever style they think best (except the medley style, in which athletes must use all four styles). A common cause for disqualification is when the competitor, while swimming, touches the neighbouring lane or obstructs another competitor. Backstroke resembles freestyle swimming as far as the alternating movements of arms and legs. When starting, competitors take their place in the swimming pool facing the pool’s wall and holding the starting points’ handholds with both hands. A common cause for disqualification is crossing the 15 m line during the glide at the start or at the turn. This is a fairly complex swimming style, calling for perfect coordination of arm and leg movements. In direct contrast to freestyle and backstroke, hand and legs must move simultaneously. If the swimmer gets out of synch, he or she will be considered by the judges as swimming freestyle and be disqualified. Another common cause of disqualification is if a competitor touches the wall with just one hand during the turn. Butterfly is the most spectacular swimming style. The athlete’s body moves in such a way that resembles the movements of a dolphin. Their legs move simultaneously, while the whole body is used to propel the athlete forward. A common cause for disqualification is if the competitor touches the wall with one hand during the turn, or moves their legs contrary to the regulations. In medley individual events, the swimmer competes in every swimming style, at equal distances. This event combines technique, speed, and endurance. The sequence followed is: butterfly, backstroke, breaststroke, and freestyle. Events: 4x100m freestyle, 4x100m medley, 4x200m freestyle. Four swimmers from the same team compete in relays, using all four swimming styles, the sequence being: backstroke, breaststroke, butterfly, and freestyle. Relay changeovers are valid when the feet of the outgoing swimmer detach from the board at least 3/100 seconds after the fingers of the incoming swimmer touch the wall. If the outgoing swimmer moves too early, their team is disqualified.